This section describes the concepts behind async execution within Trisul LUA scripting framework. Please refer to T.async documentation for function reference. This section explains the motivation and design of this execution model. The T.async interface provides methods to help you do long running I/O tasks that do not block the streaming pipeline. The tasks are executed by a separate worker thread pool and when the results are ready, they re-enter the pipeline path. The number of worker threads is by default 1 but can be increased by the request_async_workers parameter at the plug-in level. Recall that the Trisul LUA api supports ‘frontend’ (fast path) and ‘backend’ (slow path) scripts. The T.async methods are designed for use in scripts that are involve some I/O that can block the streaming pipeline. when backend scripts block : backend script have more time budget than front end scripts, but if they block it can result in some metrics being lost because Trisul being a real time streaming engine requires all backend work complete in under 60 seconds. Using the methods in T.async you can perform these tasks out of the main pipeline in a separate thread pool. Use the global parameter TrisulPlugin.request_async_workers to change the default number of worker threads (1). 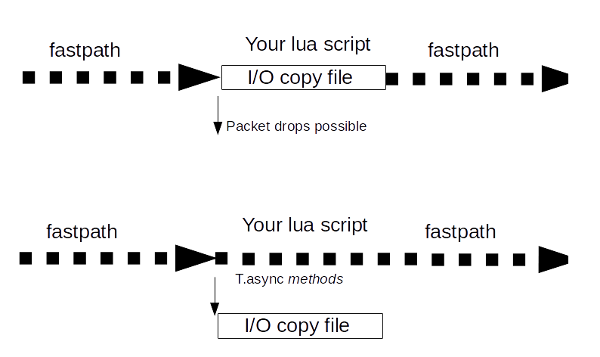 method 1: copy the file directly in lua. synchronous method. This would work, but the problem is while the os.execute(..) is copying the file, the packet pipeline is blocked. This may result in packet loss. We therefore recommend that whenever you do I/O you use any of the T.async methods. T.async:schedule described in the next section allows you to run any lua function out of the fast path and then call back in when results are available. Here is how you would do it using that method. T.async methods cp cat accomplish very specific tasks. Using the T.async:schedule method you can run any arbitrary LUA code off the main packet pipeline.